The Canadian Radio-television and Telecommunications Commission (CRTC) spent last week reviewing Canada’s Wireless Code, which has governed the country’s telecom industry for the past three years. When the CRTC first enacted the Code, its intention was always to return to the document after three years to make new changes as necessary. While this refurbishment likely won’t equal the upheaval caused by the introduction of the Code in 2013, mainly due to the elimination of three-year contracts, significant change is still expected. A number of themes emerged from last week’s hearings that not only revealed how much the wireless landscape in Canada has changed, but how the code will need to adapt in order to properly reflect those changes. Several independent parties that took part in the review complained that carrier unlocking fees remain too expensive. For those who are unaware, smartphones purchased through a carrier are often locked to that particular provider. In order to ‘unlock’ the phone, allowing it to work with any telecom provider, most carriers charge a fee. As it currently stands, the Wireless Code requires carriers to provide unlocking services to consumers who request them. However, wireless service providers continue to charge high fees, usually as much as $50, for this service. For his part, CRTC chairman Jean-Pierre Blais suggested that unlocking fees should be available at a fixed price far below $50. Other parties, however, including the Consumers’ Association of Canada, the Council of Senior Citizens’ Organizations of British Columbia, National Pensioners Federation, and the Public Interest Advocacy Centre, recommended the elimination of unlocking fees entirely. Carriers often argue that they need to have some control over the devices they sell, though, in markets like the U.S, regulations exist that state there’s no rationale for wireless service providers to charge an unlocking fee if a consumer has already paid off their device. While many of the carriers didn’t address the prevalence of bill shock in the Canadian wireless market, several of the special interest groups in attendance during the hearings expressed that bill shock is still a frequent occurrence for many Canadians, despite improvements over the past few years. One of the main disconnects highlighted by said groups is that data is still treated as an add-on by many carriers, rather than an essential component of a wireless contract. To address those concerns, the CRTC suggested that the Wireless Code be amended to give parents more control over their household data limits. One method of doing this may give parents the ability to authorize their child to incur overages if they believe their child is responsible enough to stay within their data limit, or the ability to refrain from authorizing overages should the child frequently go over their limit. Lastly, one group argued on the first day of presentations that despite an obligation to make consumers acutely aware of their contractual obligations, only one out of the 12 providers briefly showed customers a copy of their contract. Often times, wireless subscribers aren’t given a chance to look at their contract closely, the group argued. Another theme that arose during the various presentations made by Canadian network providers were the interests of both large and smaller carriers. For example, Eastlink emphasized its rural customer demographic throughout much of its presentation, stating that the Wireless Code has allowed it to operate in a way that best serves its base. The regional carrier went on to insist that reducing the powers of the Wireless Code would inhibit its service, and went on to argue that any changes to the regulatory document should enhance its ability to operate how it was intended to. Other smaller carriers like Freedom Mobile openly advocated for putting an end to unlocking fees, and further suggested that all devices be sold unlocked to begin with. SaskTel, on the other hand, suggested minimal changes to the Wireless Code, arguing that consumer decisions and the free market be allowed to direct Canada’s wireless space. The national carriers, meanwhile, argued in favour of less regulation, despite having made the conditions of the Wireless Code work to their favour. Telus, for example, argued in favour for the reinstatement of contracts that fall outside the two-year margin. While Rogers argued to institute a $50 cap on data overages for single line accounts, and a $100 cap on data overages for multi-line accounts, Telus argued the other way. 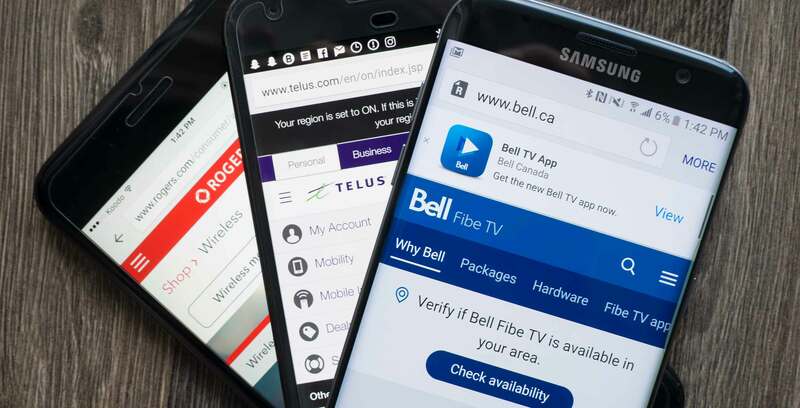 Rather than increasing the $50 cap, Telus stated that provincial legislation should be amended to make sure that the Code is the only regulation they’re required to abide by. One of the more interesting insights into the Wireless Code came from two special interest groups representing the deaf and blind communities. During this portion of the hearings, the Deaf Wireless Canada Consultative Committee shared data it collected revealing that 20 percent of deaf and hard of hearing individuals have unlocked smartphones, and that 77 percent have a contract with one of the big three carriers. Of this group, 53 percent went over their data plans and 54 percent have data buckets between two and six gigabytes. Thus, the group advocated that data buckets begin at 4GB to accommodate the deaf and hard of hearing community, who use largely video to communicate with friends and family members. Furthermore, the group argued that contract terminology should be translated into American Sign Language (ASL) and Quebec Sign Language (LSQ). The group also noted The Commissioner for Complaints for Telecommunications Services (CCTS) does not offer resources for deaf and hard of hearing Canadians who want to make complaints. In addition, wireless service providers were asked to forge relationships with companies that can do sign language interpretation of video, or video remote interpreting. The deaf community also pushed for the complete elimination of data caps. “We don’t want to be penalized for data overages because that’s our only mode of communication. So that is one thing that we really want to emphasize, unlimited data is our preference,” said a representative for the Deaf Wireless Canada Consultative Committee. Please see #CRTC #Wireless Code questions in #ASL https://t.co/fpiRzBb5GD? Correction: An earlier version of this article stated that Rogers argued in favour of the CRTC allowing contracts that are longer than two years. In reality, it was Telus that argued this point, noting that monthly bills could be reduced by amortizing the cost of a zero dollar phone over 36 months.